This week's tablehopper: kinda soggy. My bowl of chicken soup with kluski. And eggs. And vegetable juice pulp. And fennel fronds. Photo: © tablehopper.com. Happy first day of spring—yeah, and it’s raining and I’m on day four of a really stupid cold that decided to come in for a landing after my full-throttle seven days last week. I have been lucky all winter, so I guess my number was up. Fine. 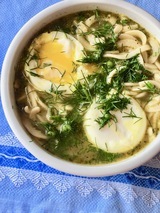 Chicken soup with kluski (thanks Bob for the noodles!) and buttermilk pancakes have been my feel-better friends. I was joking that I needed one of those whale/Shamu lifters to get out of bed this morning. As a friend noted, gravity is so much fkn worse when sick. Rude, gravity! Rude! I was hoping to get some Easter/Passover options in today’s issue, but my body said bed was a better option. But you need reservations, so here’s last year’s post for some ideas since most places tend to repeat their holiday offerings. I will quickly add that 54 Mint has a great Easter menu, and 15 Romolo does an annual boozy Easter brunch. In the East Bay, newbie Donato & Co. is doing a delicious and affordable Easter menu, and my buddy at Perle Wine Bar in Montclair is doing a bang-up Easter brunch menu. And there’s always OpenTable for Easter options. Buona Pasqua, tutti! Oh, and Comal’s sixth annual Mexican-inspired Passover seders are April 2nd and 3rd. Rock cod “gefilte” fish cakes with chipotle aioli? Awesome. Okay, it’s time to clock out here. I have a hot date with my Kleenex box. Until next week! Saturday’s devastating four-alarm blaze in North Beach. Photo courtesy of Justin Deering. 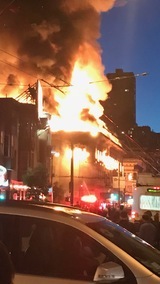 Saturday evening, I was home in bed and watching in horror on Twitter as a four-alarm fire in North Beach tore through the 650 block of Union Street, primarily the building at 659 Union (between Powell and Columbus). Amazingly no one was injured, and it ends up the majority of the building was vacant upstairs due to a previous fire in 2013 (remember when Coit Liquor and Rogue Ales suffered from that fire?). Well, unfortunately, the list of damaged businesses is much graver this time: it doesn’t look like Rogue Ales will reopen according to their Facebook page, and Tuk Tuk Thai, The Salzburg, and Ferry Plaza Seafood all have serious damage. Eater reports that nearby Michelangelo Caffe has also sustained fire-related damage. We’ll have to see what happens in coming days, but here’s one glimmer of help: Hoodline reports that Interim Mayor Mark Farrell has activated the Small Business Disaster Relief fund, which means “each business impacted will be allowed to access up to $10,000 in financial assistance for inventory replacement, equipment purchases, employee salaries, and even security deposits for new leases elsewhere.” With more than 50 employees affected, this fund is truly helpful. The Salzburg—which was such a beautiful bar handcrafted by owner Jay Esopenko and had just opened back in September— has also launched a GoFundMe, you can read more here. Best wishes to all as they try to recover, I will keep you posted on updates. Since we’re in the neighborhood: just around the corner, it ends up ~CAFFE ROMA~ has closed after 29 years. According to a note in the window, they decided “not to renew our lease and concentrate on our families and other Caffe Roma locations,” so their SoMa location (885 Bryant St. at 7th) and Millbrae location remain open. You can read more in the post in Hoodline. 526 Columbus Ave. at Union. 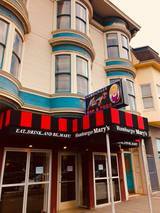 The former Patio Cafe is now Hamburger Mary’s. Photo via Facebook. The Hot Mess; Yelp photo by Genevieve Y.
It’s like Tales from the Crypt over in the Castro, but really, truly, The Patio space has reopened after being closed since, uh, 1999. (No word if they found some drag queens hiding under the deck.) The Les Natali-owned space has finally been transformed into a location of ~HAMBURGER MARY’S~, which started as a beloved SoMa burger joint in 1972 and has since morphed into a national chain, so don’t expect any groundbreaking culinary magic here. But you can get some nachos, and burgers made with a custom blend from Weber Quality Meats (brisket, short rib, and chuck), and there will be some sassy drag performers to keep things fun. Plus Ru-Paul’s Drag Race screenings, you know it. Check Facebook for updates on what’s going on and who’s servin’ (lewks, shade). Let’s just all be happy that huge space is open once again. That was ridiculous. Hours will expand and brunch is coming, but for now, food is served Sun-Thu 4pm-10pm, Fri-Sat 4pm-11pm; bar until 2am. 531 Castro St. at 18th St.
Over in Mid-Market, ~LITTLE GRIDDLE~ has reopened after two years of renovations (which were supposed to take two months). Hoodline shares that the space is back in action and a little lighter and brighter, serving breakfast, brunch, sandwiches, and burgers, and the next-door wine bar, Mavelous Coffee and Wine Bar, is serving Stumptown Coffee and pastries. The two businesses are now one: ~MAVELOUS COFFEE BAR AND LITTLE GRIDDLE~ and are also now connected with one entrance. Soft opening hours are 7:30am-3pm. (Mavelous is expected to stay open later into the evening, TBD.) 1400 Market St. at Fell. And here’s an update on a place I am missing: after Michelin-rated sushi bar ~KINJO~ suffered flooding back in October 2017, it looks like they are aiming to reopen by the end of April. The exact date depends on construction, and since it’s raining again, that makes things tough. I’ll keep you updated. 2206 Polk St. at Vallejo, 415-921-2222. Spam musubi at Aina. Photo: © tablehopper.com. Crispy oysters and horseradish on Commonwealth’s new extended tasting menu. Photo courtesy of Commonwealth. Shrimp mousse and sweetbreads course at Commonwealth. Photo courtesy of Commonwealth. You have a new lunch option to add to your roster, and it’s a great one: ~AINA~ in Dogpatch is launching lunch Wed-Fri 10am-2:30pm, with their housemade Spam musubi and some new lunch-only dishes, including a pork tonkatsu sandwich (kalua pig terrine, fermented cabbage, namasu, kimchi aioli; $14), North Shore garlic shrimp (ginger, garlic, XO, scallion, smoked sesame; $11), and a bento box (egg custard omelet, pickle, roasted cauliflower, mac salad; $15). The brunch menu will continue on the weekends. And if you haven’t headed in there for the mo’olelo tasting menu, you really should. Trust me on this. 900 22nd St. at Minnesota, 415-814-3815. Over in Hayes Valley, ~BARCINO~ has launched weekend brunch, with dishes like the ou (slow-poached eggs, housemade chorizo hash, piperade, green harissa, toast), the tortilla (Catalan egg and potato omelet, Dungeness crab, Meyer lemon migas, holandesa), and the torrijas (cinnamon French toast, caramel apples, whipped crème fraîche, candied almond). Sat-Sun 11am-2:30pm. 399 Grove St. at Gough. At ~COMMONWEALTH~, chef Jason Fox has launched a new extended tasting menu: $125 for 12 courses, including a few snacks and mignardises, plus $70 for beverage pairing. He was already creating these extra courses for advance guest requests and decided he may as well roll it out as a menu. This way you can taste his favorite dishes, including some rare seasonal items. Take a look here. Really, take a look. Wow. 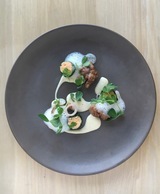 There are courses like shrimp mousse wrapped in lettuce, sweetbreads cooked in beeswax, popcorn puree, yuzu kosho milk. Boom. The regular tasting menu is $85 for 7 courses, plus $55 for beverage pairing, and will remain a menu option. 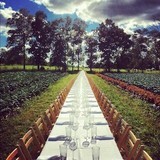 The long table at an Outstanding in the Field event. Photo courtesy OITF. Here’s a quick-fire round of some fantastic food events for your consideration! This Thursday March 22nd, No Kid Hungry presents the 11th annual Taste of the Nation event at Pier 35, with top chefs and restaurants like Octavia and Frances, Lord Stanley, China Live, Rooh, and State Bird Provisions. Details and more here. Presidio Picnic has returned on Sundays (11am-4pm) for its sixth season (through October 21st). There are more than 25 international mobile food creators courtesy of Off the Grid (like El Pipila, Señor Sisig, Del Popolo), music, lawn games, yoga, bike safety classes, and nature-based arts and crafts for kids. Plus, there’s a full bar presented by Rye on the Road, featuring wine, beer, spirits, and craft cocktails. There’s a free water refilling station, so please bring your own bottle. One new addition: there’s now a free cultural dance performance on the fourth Sunday of each month (on April 29th, SF Awakko-Ren Dance Group performs Awa Odori, one of the most well-known Japanese traditional dances with 400 years of history). Do you have your tickets for Pebble Beach Food & Wine? The premier epicurean event returns April 5th-8th, when 120 renowned chefs and 250 distinguished winemakers from across the globe descend on Pebble Beach, with interactive cooking demonstrations, rare wine tastings, epic culinary collaborations, dinners, outdoor grilling and taco events, and the Lexus Grand Tasting tent in the country. Look for some live musical offerings this year too. Tickets are on sale today for Outstanding in the Field’s 2018 tour! In May and June, OITF has farm-to-table dining events planned in the San Francisco Bay Area, returning to California for fall events in October and November. May 6th has guest chef Ravi Kapur (Liholiho Yacht Club) at Jacobs Farm at Martial Cottle Park, San Jose, while May 20th has guest chef Gonzalo Guzman of Nopalito at Stemple Creek Ranch in Tomales, and Nicolette Manescalchi of A16 will be somewhere on June 16th. Check it all out and get your tickets! The handcrafted bar at Howells. Photos courtesy of Howells. 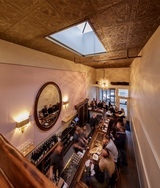 Looking down on the bar from the mezzanine. A couple of weeks ago, I got a sneak peek of ~HOWELLS~ wine bar, which just opened in the former Mezes in the Marina. You’ll recognize Nate Welch behind the bar; he managed the California Wine Merchant for a decade and has now partnered with some other folks on this project (Sameet Mehta and Adam Weiner). There’s a spacious and beautiful bar (25 feet! ), built by Welch’s father-in-law, Don McCall. It’s rustic and so handcrafted, made of walnut and roof metal from a old barn that suffered in the Butte Fire of 2015, with hickory frames, wood dowels, and a resin top. (McCall is quite the craftsman—he has been working on the bar since September!) 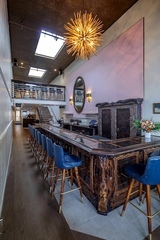 The space has bright blue vinyl bar chairs with tufted backs, and there are skylights, Deco-style brass sconces, an unusual chandelier made of sticks, and a pressed tin ceiling that is actually made of acoustic tiles. It’s a handsome space, and there’s also a mezzanine with more seating and a private cellar room you can rent for tastings of high-end and rare wines, with room for six to eight people. There are also plans to open the back patio soon for brunch. The main wine list has 20 by the glass, featuring a variety of Californian, old-world, and Southern Hemisphere wines. There’s quite a cellar list of high-end wines too. Chef Sarah Galloway (formerly Spruce, Trestle, Stones Throw, Mason Pacific) is offering a Cali comfort menu that spans cheese and charcuterie options, plus sandwiches, salads, and some Midwestern dishes (with a touch of Cali) like stuffed peppers and beef stroganoff. Dishes will range around $8-$16, but you can also splurge on some caviar from The Caviar Co. While the block doesn’t seem to be wanting for wine options, they have created a space and vibe that is a bit different than the others, and they want guests to come by for dinner, or a glass before or after. Opening hours will be daily 4pm-12am and until 2am Thu-Sat. 2373 Chestnut St. at Divisadero, 415-814-2150. The Deco vibes of the Rumpus Room on 6th Street. Yelp photo via business owner. Surf’s up! The new Mavericks menu at Lord George is all about spring break. Photo courtesy of Lord George. With so many high-concept bars opening these days, it makes me happy to see a classic, Deco-inspired bar that has the same kind of feels as Dalva open up, and it has a cheeky name to boot. Meet ~THE RUMPUS ROOM~, newly open in SoMa in the former Matador/Showdown (and as I fondly but blurrily remember, The Arrow Bar), and I’m sure some old-timers could tell us many more names since the location has continuously operated as a bar since 1935. It has some Deco decor, and there’s even a Photo-matica photo booth. Hoodline reports the owner is longtime bartender Roxzanna De Marco (Amnesia, Southern Pacific Brewing), and she obviously knows what the people want: $5 well drinks (and she loves tequila, so it’s a good one), with most draft beers at $6 and a draft Budweiser at $3. There’s a cocktail menu, a Moscow Mule on tap, and happy hour runs from 12pm-5pm, when most drinks are $1 cheaper. Look for some DJ nights too. Open 12pm-2am. 10 6th St. at Market, 415-780-5651. It’s about that time, when ~LORD GEORGE~ launches their next guest Mavericks menu—this time it’s Brian Means (previously bar director for Michael Mina and currently at PCH), who has designed a spring break-themed cocktail menu (complete with handwritten postcards!) filled with tropical flavors. Peep the menu here, it runs until July 1st (and the bar donates 50 cents of every Mavericks cocktail sold to the guest bartender’s charity of choice). 555 2nd St. at Brannan, 415-660-7633. 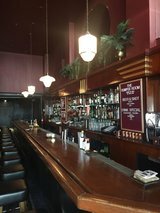 The Bay Area Anti-Temperance Society and the California Cocktail Club—plus The Speakeasy—are hosting an event on Thursday March 22nd to celebrate the 85th anniversary of the end of Prohibition, and you’ll be on the U.S.S. Potomac in Oakland! Of course, there will be cocktails, plus music and tours. More details and tickets here. We seek an energetic professional with a minimum of two years sous chef or supervisory experience in a full-service, high-volume restaurant facility. The ideal candidate should be passionate about Italian cooking and handcrafted foods, knowledge of extensive butchery and making of salumi is a plus. Le Marais Bakery and Bistro is currently looking to hire a full-time pastry assistant for our forthcoming commissary in the Tenderloin. The position will start immediately for training at our Marina location. This is a wonderful opportunity to learn French baking and pastry techniques at one of the best San Francisco bakeries.